Reportage on an anti-protest proposal under debate at City Hall has sparked a new type of demonstration — one pushing back against the journalists covering the fray. 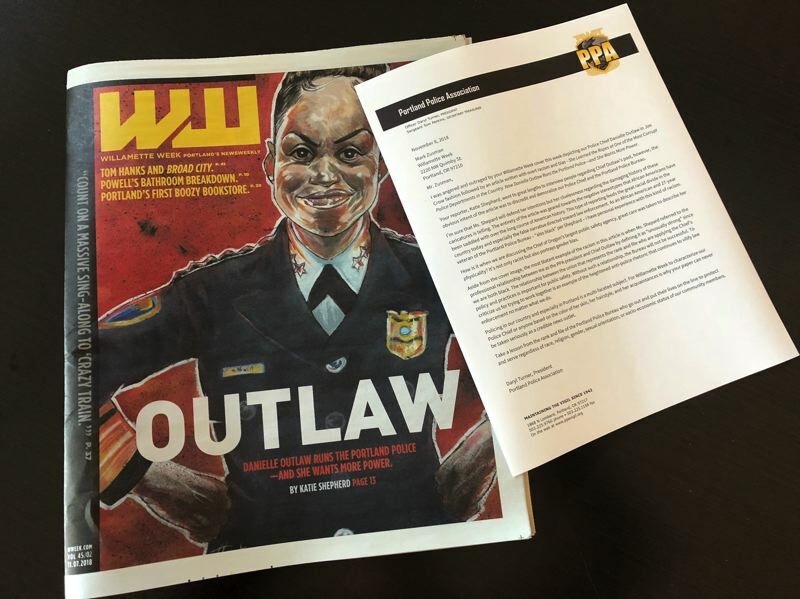 Portland Mayor Ted Wheeler and law enforcement union leader Daryl Turner slammed a recent front-page illustration of Police Chief Danielle Outlaw published by a local alt-weekly. They say it's racist. Wheeler called it "a caricature of our Police Chief, harkening back to the Jim Crow era," a reference to the racial segregation laws enforced across the U.S. after the end of the Civil War. Turner — the outspoken president of the Portland Police Association — said he had "personal experience with this kind of racism" during his 27 years on the force. "The entirety of the article was geared towards the negative stereotypes that African Americans have been saddled with over the long course of American history," Turner wrote in a public letter to Willamette Week. "Take a lesson from the rank and file of the Portland Police Bureau who go out and put their lives on the line to protect and serve regardless of race, religion, gender, sexual orientation, or socio-economic status of our community members," he continued. Turner also said the article included out-of-place descriptions of Outlaw's appearance and hairstyle. It wasn't too long ago that Turner had his lambasting pen aimed squarely at the Mayor, but the two now seem to agree that the Portland Police Bureau needs more legal tools to separate protesters looking for a fight. The proposed ordinance that would allow city leaders to dictate the time and place of political rallies was hotly debated on Thursday, Nov. 8, but no vote was taken. The American Civil Liberties Union has argued the proposal is an unconstitutional limit to free speech, and suggested they will challenge the rule in court if it is approved. Protests in Portland are nothing new, but officials say the showdowns between the conservative members of Patriot Prayer and leftist counter-protesters known as Antifa are little more than pre-planned street brawls. Since assuming office about a year ago, Chief Outlaw has at times been treated more like a politician than a civil servant — with journalists breathlessly repeating her statements on radio interviews. That said, the chief of police is usually a higher-profile position than leadership in other bureaus. It's also worth noting that Willamette Week has a long history of publishing unflattering cartoons of public figures, including Gov. Kate Brown, former Mayor Charlie Hales and many other lawmakers. It once memorably depicted the current mayor as Paul Bunyan for a cover story. Mark Zusman, editor and publisher of Willamette Week, said it was merely coincidental that the controversial cover illustration was not republished on the paper's website. "The cover illustration of the police chief never appeared on the website at all, which is often the case with our cover image," he said in an email. "We will be responding to the criticism in next week's paper."